Welcome to the new Varsity Chrysler Dodge Jeep site! 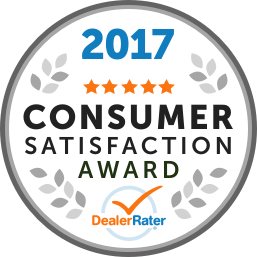 We are proud to be Southern Alberta's Largest Chrysler Dodge Jeep dealer. Our mission is very simple - when you drive your vehicle home, we want you to be absolutely 100% satisfied with your experience at Varsity - whether that be in sales, service, body shop or parts experience. Our sales department offers you superior inventory, pricing, service and the best overall buying experience possible through both our salespeople and our Internet Sales Department that can take care of your entire vehicle purchase via email so you can purchase your next vehicle right from your computer. Our excellent sales staff are standing by to share their knowledge with you, our customer. We encourage you to browse our new Chrysler Dodge and Jeep inventory, schedule a test drive or research financing options. You can also request more information about any vehicle using our online form or by calling us toll-free at (888) 348-6037. Come see Calgary's best selection of new and pre-owned vehicles including such models as Jeep Wrangler, Jeep Liberty, Chrysler 300, Dodge Ram 1500 and much more. We also carry imports like Honda, Toyota, Mazda, Volkswagon and more. 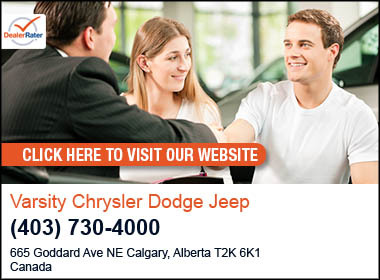 If you'd like to check out a Chrysler, Dodge, Jeep or any other vehicle in person, click on Directions for our step-by-step driving instructions to Varsity Chrysler Dodge Jeep, or give us a call locally in Calgary, Alberta or toll-free both at (888) 348-6037. We look forward to serving you! If you don't see a particular vehicle, click on CarFinder and complete the form. We will gladly inform you when a matching car arrives. Also, don't forget to like us on Facebook for even better deals! "Poor service, manager not available." Brought our Jeep here for an insurance repair, they kept pushing completion date and when we were finally able to pick up, they wanted an additional $500 fee. For what? We don’t know and he wasn’t there to explain. Receptionist or service department refused to speak to our insurance adjuster. Waste of our time and them taking advantage. Other Employees : Receptionist and sales manager who offered no solution. "Poor management FYI lier "
Poor quality service, avoiding customer, left vehicle in worse shape. Would never ever recommend this service department or dealership to anyone. My advice to improve is simple, call your customer and communicate better in the future, care about your quality of service and never ever avoid a situation you are responsible for!! !